After unveiling the 2020 Corolla Sedan last year with an all-new design inspired by the 2020 Corolla Hatchback, Toyota has announced pricing details for the stylish sedan. The good news is that it doesn’t cost much more than last year’s model, despite being redesigned on a completely new platform. Pricing for the base L model starts at $19,500 plus a $930 destination charge, which is only $800 more than its predecessor. It’s generously equipped for an entry-level model too, with LED headlights, LED taillights and body-color exterior components included as standard. Inside, you get a tilt/telescopic three-spoke steering wheel, fabric seats and an analog instrument cluster with a 4.2-inch Multi-Information Display. Standard tech includes power windows/locks, a six-speaker audio system, and a seven-inch touchscreen infotainment system. The entry-level Corolla L also comes with a rear-view camera and the Toyota Safety Sense 2.0 suite of driver assistance systems, which includes a Pre-Collision System with Pedestrian Detection, Lane Departure Alert with Steering Assist, Auto High Beam Headlights, Full-Speed Range Dynamic Radar Cruise Control, Road Sign Assist and Lane Tracing Assist. Moving up the range, the Corolla LE costs an extra $450. For that, you get an upgraded interior with premium fabric seats, metallic trim, an additional USB port, a larger eight-inch infotainment system and a rear seat with a center armrest. The Corolla L rides on 15-inch alloys, while the LE trim gets 16-inch steel wheels with covers. 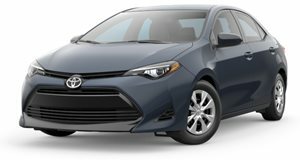 The Corolla XLE, on the other hand, will set you back $23,950, which comes equipped with premium LED headlights and a moonroof, a blind spot warning system and mirrors with integrated turn signals. Bigger changes can be found inside the cabin, as the XLE trim adds SofTex heated front seats with eight-way power adjustment on the driver’s side, a leather-wrapped steering wheel, a keyless entry system and a seven-inch Multi-Information Display in the instrument cluster. All three of these models are powered by a 1.8-liter inline-four engine that produces 139 horsepower and 126 pound-feet of torque. If you’re looking for something sportier, you may want to upgrade to the Corolla SE or XSE, which pack a more powerful 2.0-liter four-cylinder engine that produces 169 hp and 151 lb-ft of torque. Starting at $21,950, the Corolla SE also gets sportier styling tweaks including a mesh grille, gray metallic side skirts, and a body-color rear spoiler. The model also has a dual exhaust system and 18-inch alloy wheels with black accents. Inside, the Corolla SE comes with premium sport seats and a leather-wrapped steering wheel as standard. The Corolla SE is the only variant offered with a CVT transmission. Adding a manual transmission brings the price up to $22,650, but you also get additional equipment such as a moonroof and a keyless entry system. At the top of the range is the Corolla XSE, which starts at $25,450. It comes fully loaded with SofTex upholstery, heated front seats, an eight-way power driver’s seat, blind spot warning system, a gray metallic rear spoiler, a keyless entry system and a seven-inch Multi-Information Display. Finally, the Corolla LE Hybrid carries a base price of $22,950, which features a hybrid powertrain producing 121 hp. US sales for the 2020 Toyota Corolla Sedan will begin in March.